Enalapril is used to treat mild, moderate or severe heart failure and high blood pressure and is usually used in combination with other medications. It is available as 2.5mg, 5mg, 10mg and 20mg tablets. 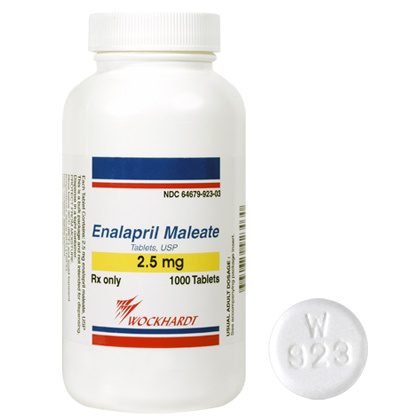 Uses: Enalapril is in the class of drugs called ACE inhibitors. It dilates the veins and decreases fluid retention. It is used in dogs, cats, and ferrets for the treatment of heart failure, dilated cardiomyopathy, and high blood pressure. It is also sometimes used in the treatment of some types of chronic renal failure. Results should be seen within about 2 weeks. Dose and Administration: Always follow the dosage instructions provided by your veterinarian. If you have difficulty giving the medication, contact your veterinarian. Give the oral form by mouth, with or without food. If using the transdermal gel, apply to the skin as directed by your veterinarian. Do not abruptly start or stop this medication without approval by your veterinarian. Treatment is normally continued for the duration of the animal's life. If you miss a dose, give it as soon as you remember. If it is almost time for the next dose, skip the one you missed and go back to the regular schedule. Do not give 2 doses at once. This medication should only be given to the pet for whom it was prescribed.